Dr. Bussara Jessadapagorn graduated from the Faculty of Dentistry, Prince of Songkla University, Thailand in 2011 with a Doctor of Dental Surgery (DDS.) degree. 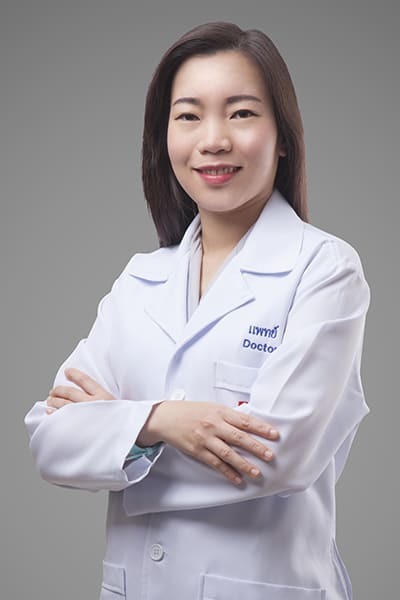 Then, she pursued her career as a general dentist and increased her professional experience at Khiensa Hospital, Surat Thani province, Thailand in 2011 and at the Bangkok-Phuket Dental Center in 2012. Finding herself head over heels in love with the treatments of disorders of the pulp as well as root-canal therapy, she furthered her studies at the Faculty of Dentistry, Srinakharinwirot University, and walked away with a Graduate Diploma in Clinical Dentistry (endodontics) in 2014. Her clinical focus has shifted to root canal treatment, traumatic injuries to teeth, facial pain beyond teeth, repairing a failing root canal, saving a tooth from having a root canal, and emergency treatment for tooth pain since then. Dr. Bussara is always gentle and sweet with her patients so that they will feel safe and have total peace of mind throughout any single dental procedure with her.